Dendromass4Euope (D4EU) aims to establish Short Rotation Coppices (SRC). Associated with that D4EU implements a dedicated monitoring and applied-level research to ensure plantation quality, production stability, optimum poplar variety selection and risk avoidance. Our Slovakian partner Daphne carries out field research for an environmental impact assessment and has already examined some more than 50 fitting localities for that. So, by now a total area of around 1000 ha are chosen to be observed for the first monitoring season. During the project runtime Daphne will raise this area to 2500 ha. D4EU aims to monitor 5 biological features, such as habitats, birds or beetles. 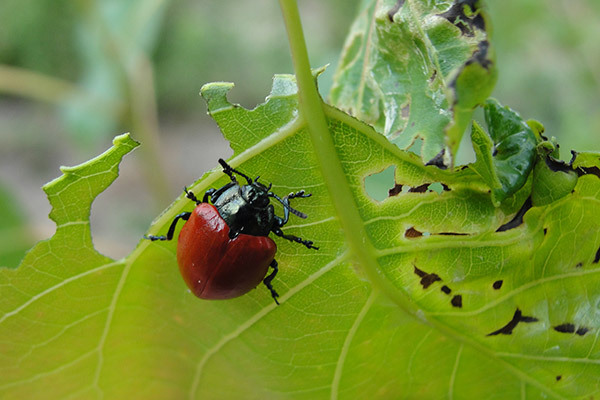 The picture shows a red poplar leaf beetle (Chrysomela populi), which loves eating fresh poplar or willow leaves. Growing up to 12 mm length, it can become a serious risk for poplar SRC. Although the beetles look quite nice, you should be careful when picking them up: Poplar leaf beetles can release a smelly phenol-scented secretion to drive off the enemy. They produce this secretion from salicylic acid from their food plants.